Our Southampton Team really wanted to come up with a professional and dramatic look for this interesting, London-based company. They have a very original approach to Corporate and Customer Strategy and needed a classically fashionable website to attract new clients. This website uses different black and white images as the backgrounds for each page. This gives the website a very glamorous and stylish design with flashes of the signature duck egg blue from their company colours. It's dressed to impress and makes a memorable first impression. This website also makes use of a couple of great navigational features. The Page Search Bar, ever present in the top right hand corner, allows visitors to the website to search for a topic or keyword of their choice and if a page on the site uses this word, it will appear underneath. If the potential client doesn't have anything so specific in mind they can use the main menu bar, complete with drop down menus, to see a better overview of the website and choose a section to read from. If you are looking for a dramatic website design like this or simply looking to add one of these great features to your own website, just get in touch with Toolkit Websites, Web Design Southampton and we will take it from there for you. 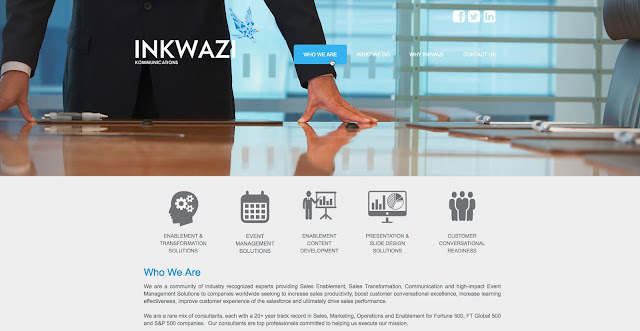 Our Website Design Team based in Southampton really loved working on Inkwazi's new website and so decided to make this our Website of the Week. The design of it demonstrates a lot of the trends going on in website design at the moment with its panel-style backgrounds and pastel colors. Grey and blue, though very corporate, have been softened to match the quirky but professional eagle logo. The Fish Eagle (the meaning behind the word 'Inkwazi') and the colours used achieve a friendlier tone better suited for this company, dedicated to working with charities, helping them to stand out from other corporations in the field. This simple yet modern design also makes a good frame for the well written and organised content within. The main menu and sub sections represented by custom icons in the Home Page Dressing sit above an attractive Twitter Feed integration which will help Inkwazi reach out to clients as well as impress Search Engines like Google. You can see this organisation is also continued onto each internal page of the website. Each section is represented by custom backgrounds & custom icons. It's so easy to navigate using the four main sections in the website menu at the top. Then from there, you can find the Services section with five sub sections to jump between, complete with 'Back to Top' buttons every step of the way. This is a great example of a website to look at if you're thinking about ways to structure your own content. The design fits in perfectly with this resulting in a great website for a truly deserving company.